16th June 2014 – the great day arrived when Forced Marriage in the UK became a criminal offence. Bilston Club is very proud to have helped with the work of Karma Nirvana in campaigning for this new legislation. The real work now begins with the important work of promoting the contents of this new law. It is hoped that we can facilitate awareness raising sessions in schools in Wolverhampton. Jasvinder spoke to staff at the Bilston Academy in June and we hope this will lead to more teacher and pupil sessions. On the 8th June 2012 the Government announced the that FORCED MARRIAGE is to be CRIMINALISED. Soroptimists have helped to empower women and girls in the United Kingdom by completing the Home Office Consultation and supporting Karma Nirvana’s postcard campaign. Jasvinder has acknowledged the Soroptimist support as immeasurable. Thank you to everyone who helped with this project. Soroptimists can make a difference! 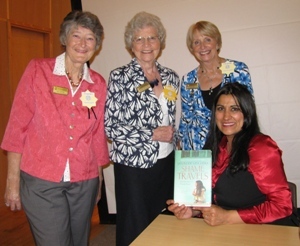 At an evening in 2011 when Jasvinder spoke to an audience of Soroptimists and professionals about Forced Marriage and so called Honour Based Crime. Jasvinder signing her books for guests. 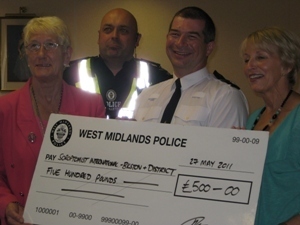 from Superintendent Payne and Sergeant Dave Willetts, West Midland Police . 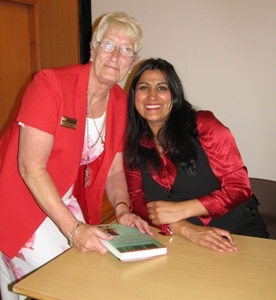 We were delighted when Jasvinder Sanghera accepted an invitation to speak at a Bilston & District Charity Evening held on Friday 24th June 2011, at Coven Memorial Hall, Wolverhampton. Bilston club members invited friends, other Soroptimists and professionals including, solicitors, police, probation officers, staff from women’s refuges, Women’s Aid to join them for what was a very special evening. The room was full of 200 enthusiastic listeners. Despite an exceedingly busy schedule, (Rome the day before and Royal Courts of Justice on the very day of her visit), Jasvinder was pleased to be invited to again speak to Soroptimists and their network. Jasvinder established Karma Nirvana in Derby, a safe haven and advice centre for young girls affected by the impact of forced marriages and domestic violence. She was an inspirational, dream speaker who captivated her audience. Jasvinder is known, nationally and internationally for her work and has written three books, Shame, Daughters of Shame and Shame Travels. 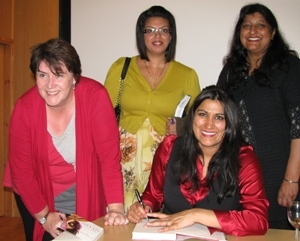 Jasvinder signed copies of her books, the last of which, Shame Travels, was launched two weeks after her visit. This provided an opportunity for audience members to speak to Jasvinder personally. The club was able to promote the organisation and Soroptimist flag ship project Violence Against Women, Stop it Now (VAWSIN). The evening raised £2000 for Karma Nirvana. The club intends to work with the Charity in its bid to change the law on forced marriage, currently not a criminal offence. The Rt Hon Theresa May MP, Home Secretary and Minister for Women and Equalities, on 12th December 2011 launched the Forced Marriage Consultation. She stated “I am clear that Forced Marriage is a form of violence against women and men. We must do all we can to stamp out this appalling abuse”. This consultation finishes on 30th March 2012. It was of the utmost importance for as many people as possible to complete the Home Office Consultation questionnaire and many members from Midland Chase Region and countrywide did this. The topic was on UKPAC website, PAM and UKPAC Chairman’s report and is part of the flagship project VAWSIN. Karma Nirvana added a post card campaign to support the Home Office Consultation. Karma Nirvana’s staff including Jasvinder gave out the postcards in Derby, Leeds, Bradford and other northern cities. SI Bilston and SI Lichfield then sent the cards to all UK Soroptimist clubs encouraging individuals to complete and return them by 20th March. On 29th March Jasvinder presented the cards personally at 10 Downing Street, London and Soroptimist contributions to the number of cards was significant. On 26th February 2013 nine Bilston members attended a Forced Marriage Conference along with over 100 professionals from Wolverhampton. The roadshow was one of a series that had been run countrywide by Karma Nirvana to raise the issues surrounding Forced Marriage. This partcular roadshow was arranged by Wolverhampton City Council, Wolverhampton Safeguarding Board, West Midlands Police, Wolverhampton Domestic Violence Forum with guest speakers. The morning speakers included, His Honour Judge Cardinal, Detective Sergeant Trudie Runham, West Midlands Police, Jasvinder Sanghera, founder of Karma Nirvana, and Chaz Akoshile joint head of the Government’s Forced Marriage Unit. After lunch Monika Bindal, a Child Protecetion Solicitor spoke followed by Kathy Cole-Evans Strategy Coordinator and Manager of Wolverhampton Domestic Violence Forum. All the speakers were most informative and inspirational. During the afternoon delegates were entertained by the New Vic Theatre Group to a performance of ‘All our Daughters’ a play with many powerful messages about Forced Marriage. BBC 6 oclock News reporters were present all day and at lunch time interviewed many people including several Bilston Soroptimists but thank goodness there was insufficient time to show those interviews at 6pm!